UNITED NATIONS, July 29 -- More than a week after the Al Shabaab insurgents ordered out from the parts of Somalia that they control some segments of the UN system, notably UN envoy Ahmedou Ould Abdallah and the UN Development Program, the UN still refuses to speak or apparently even to think about why it became a target. Inner City Press asked Ould Abdallah to respond to accusations that he has, in essence, taken sides in a civil war, and made himself a target. Ould Abdallah responded by asking, "You support the Islamists?" Video here, from Minute 12:06. Inner City Press responded that it was asking for his and the UN's response to the statements of one of the parties in Somalia. UN High Commissioner for Human Rights Navi Pillay has said, through her spokesman Rupert Colville, that "both sides were reported to have used torture and to have fired mortars indiscriminately into areas populated or frequented by civilians... The High Commissioner believed that some of these acts might amount to war crimes." Inner City Press asked Ould Abdallah if he acknowledged that the forces of the Transitional Federal Government which he supports, and also of the AMISON African Union, have at time fired mortars into civilian areas. "I don't like to introduce AMISOM as a part of a problem," Ould Abdallah said. Video here, from Minute 16:06. But isn't it the UN's role to speak out against the killing of civilians by either side? Rather than answer the questions about his neutrality, and relatedly about the efficacy of his diplomacy, Ould Abdallah joked that he is neutral because when he arrived in Somalia he said he would not engage in local politics, would not engage in business and would not get married in Somalia. But refusing to speak up about, and in fact covering up, killing of civilians by one or more of the armed forces in Somalia shows a lack of neutrality. And Ould Abdallah's still unexplained role in the joint Law of the Sea Continental Shelf filing of the Kenyan Government and the TFG, funded by oil-exploring country Norway, constitutes business in the view of some. Ould Abdallah told Inner City Press, next time we go to meet with the Islamists we will take you. 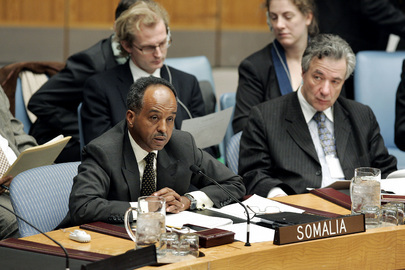 In mid 2008, Inner City Press covered the Security Council's trip to the Somalia talks in Djibouti, top heavy with TFG officials who flew in from London. Business was done, in a $400 a night waterfront Kampinski Hotel. The Press stayed elsewhere. When asked about the looting of his Office in Baidoa, in connection with al Shabaab ordering him and UNDP to get out, Ould Abdallah said it was mere theft of private property with, as a "bandage," statements against him. This is called, by some, being in denial. Also in denial is the UNDP, which on July 28 told Inner City Press that "UNDP programmes and operations continue uninterrupted in Somalia." But it was looted and ordered out of the former TFG capital, Baidoa. Ould Abdallah is a funny man. 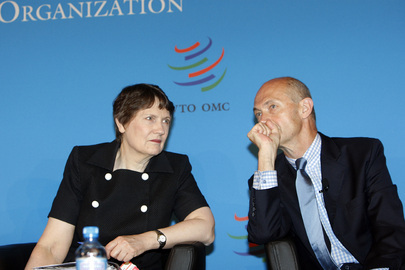 Wednesday he drew laughter when he called Somali piracy a form of hedge fund. But he did not state what if anything he has done about the problem on non-Somalis engaging in illegal fishing off the coast, or dumping toxic waste on the shore. This was by his count his fourth or fifth briefing of the Security Council and the press in the past 20 months. The situation is hardly better. Perhaps the bombast, the willful blindness and yes, the lack of neutrality, are part of the problem. 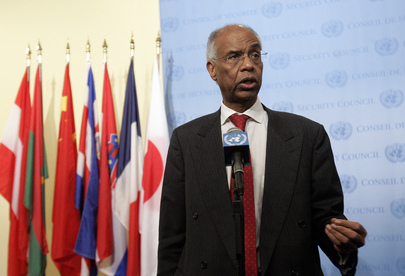 Footnotes: On July 28, as Inner City Press passed through the UN's 37th floor Peacekeeping Office on route to a briefing about the UN's New Horizon plan, Ould Abdallah asked, who invited you here? He added, with a smile, "You are impossible." Others say that he is impossible -- including to discipline or replace. A Ban Ki-moon advisor from the 38th floor told Inner City Press that following Ould Abdallah's comments that the media should not report of the killing of civilians by AMISOM forces, he was told by the UN in New York to issue an apology, but refused to. The source marveled at, and offered an explanation of, why Ould Abdallah is allowed to get away with it. The answer does not make this UN look good. Watch this site.